As you'd expect in a city this size, Backpacker Accommodation in Auckland is comprehensive and accessible. You don't have to be a young traveller to enjoy the perks of budget accommodation. Hostels are well-equipped, clean and friendly. Auckland Hostel Accommodation is some of the best in the country. They're safe, clean, friendly and, most importantly, extremely good value. Around Queen Street/Fort Street, you'll find three or four very good, state of the art hostels, all with wi-fi, kitchens, entertainment rooms and bars, and all a stone's throw from the harbour. Ponsonby Road has a couple of good backpacker places, too, with handy transport links into the CBD. Turner Street and Victoria Street, near the SkyCity complex, have a couple of great hostels, as does Anzac Avenue which, because it's just outside the CBD, has hostels with parking spaces, too. Most hostels offer dormitory accommodation alongside a small selection of private rooms, and you can get some great food and drink deals in nearby eateries, if they know you're a backpacker. 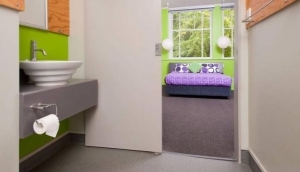 YHA Auckland International is 5-star Qualmark rated, staffed 24 hours and offers excellent amenities. Backpacker accommodation includes small and large multishare rooms..